Blog Home » Obama Used SMS Marketing. So Should You. SMS marketing is quickly becoming the hottest way of marketing around. It is used by numerous types of companies, both small and large, and works to deliver customers who’ve opted in to receive marketing messages special news, deals, offers and other important information. SMS marketing is sometimes referred to as text message marketing, and it truly works for everyone. This includes political campaigns. Text message marketing can be utilized in a number of methods for a political campaign. It can be used to promote your candidate, gain more recognition for the campaign and candidate and even inform them of the latest changes and other important information. Using SMS marketing is the technologically-savvy way to market and you should certainly jump on the opportunity ahead of you. The benefits of SMS marketing for political campaigns isn’t just talk. Think back to 2008 when our current President Barack Obama was running for office. 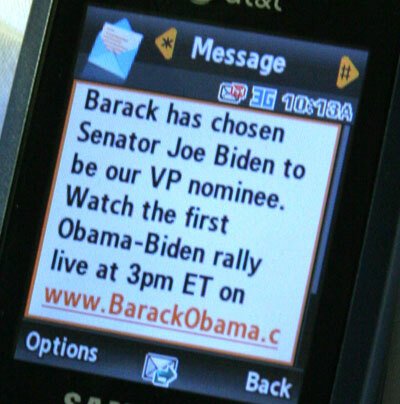 Text message marketing was still fresh then, and the Obama party jumped on the chance to see what it was all about. It is apparent it worked, as you noticed the title in front of his name! Using SMS marketing for a political campaign ensures that you reach a broader range of people. Smartphones are found in the hands of most everyone these days, and most of the younger crowd carries them. Your political query can reach the younger crowd and the older crowd, too. Almost every text message that is sent is read by the recipient! Take a look at the facts for yourself. These facts will help you better understand why your political campaign can enhance with the marketing. Text message marketing is fun, easy and worthy of your effort. In no time at all you can reach all of the people that you want to reach, ensuring they get the message that you are trying to send. It works for all, including those on a political campaign. Do not miss out on the benefits for yourself.